The Purium 10-Day Transformation is a cleanse created by David Sandoval and sold by Purium Health Products. The Purium cleanse promises to increase your energy, improve sleep, reset your metabolism, and help you lose up to 11 pounds and 8 inches in just 10 days. While that certainly sounds enticing, there are considerations to keep in mind before you try this plan. The 600-calorie-a-day weight-loss cleanse is a program designed by wellness expert and whole-foods nutrition advocate David Sandoval, author of "The Green Foods Bible" and chief science officer for Purium. There are two different 10-day transformation programs from which to choose: Purium 10-Day Transformation—Weight Loss and the Purium 10-Day Transformation—Cleanse. 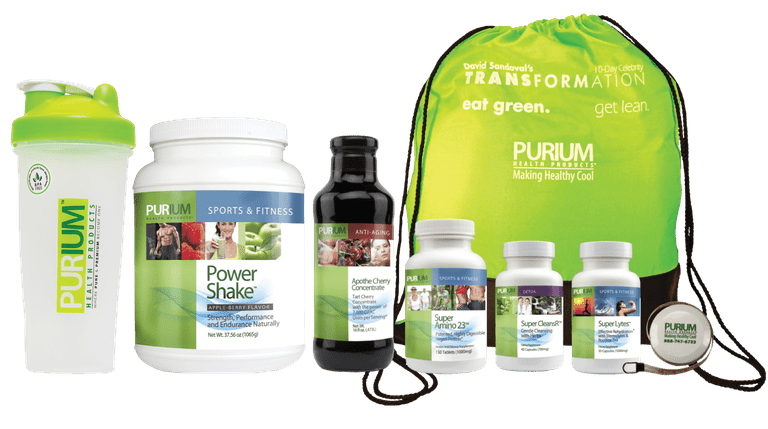 If you take on the Purium program for weight loss, you can expect to consume three shakes a day, supplements every few hours, and a tart-cherry drink at the end of the day. The plan also allows for small portions of what Sandoval calls "flex foods," such as broccoli and kimchi, which may be consumed three times a day. You may drink up to 72 ounces of water daily. Fitness activities are not promoted on this program. In fact, according to instructions, exercise should be limited to light walking and yoga while on the detox. The meal replacement shakes and supplements are spread out at two-hour intervals. Caffeine and alcohol are not allowed on the program, and Purium recommends withdrawing from these and other toxins in the days prior to starting your cleanse. The Weight Loss package also includes the Daily Fiber Blend and Super Lytes supplements, while the Cleanse version includes Super CleansR and Biome Medic. The kits also include detailed instructions, a shaker bottle, a lightweight carrying case, and a tape measure. Each package retails for about $249. However, you can sign up for a Purium Smart Order to save 25 percent. Just note that doing so commits you to automatic deliveries and payments each month. The Purium 10-day cleanse for weight loss claims to activate the hormone adiponectin, burn fat, build muscle, and aid the body in detoxifying and cleansing the digestive tract. According to Purium, the shake and supplements flood the body with nutrient-dense, low-calorie superfoods, helping to break addictions to foods containing sugar, salt, carbohydrates, and chemicals. While Sandoval claims the body does not need a lot of calories, we wondered if restricting calories to 600 a day was safe or effective, and consulted Verywell Obesity Expert Yasmine Ali, MD, MSCI, FACC, FACP. "Diets that are less than 1,200 calories per day do not provide enough energy or nutrition for the necessary, basic biological functions of an adult human,” explains Dr. Ali. “Plus, severe calorie restriction sends the body into starvation mode, which makes humans hold on to weight rather than continue to lose it. These diets usually backfire for that reason, as well as for the fact that they are simply unsustainable." I tried the 10-day transformation cleanse for weight loss, paying careful attention to follow all directions. I set an alarm to take the shakes and supplements at the appropriate intervals, only ate pre-measured flex foods, and stayed hydrated by drinking plenty of water. I didn’t drink coffee or alcohol, slept a full eight hours each night, and only participated in easy exercise sessions. The results? I lost 2 pounds, but felt tired and not any healthier than before I started. During the cleanse, I missed eating healthy whole foods and found taking supplements all day to be a bit burdensome. There wasn't anything that felt natural or transformative about drinking shakes for breakfast, lunch, and dinner, with a handful of supplements in between. There was no opportunity to learn healthy eating habits, good cooking skills, or portion control, which are all important to maintaining weight loss. When I resumed a normal diet of lean protein, fresh fruits, and vegetables, limited whole grains, and skim dairy products, the weight came back within two days. Most health experts agree that "detox" programs for weight loss that eliminate entire food groups or severely restrict your calorie intake are generally not successful for long-term health or weight loss. In addition, these programs are generally best followed while under the care of a health care provider. If your goal is weight loss, consider making an appointment with a registered dietitian to put together a plan for sustained, healthy weight loss. Both your body and your budget are likely to benefit from a more conservative approach.